Mike Leigh has over the years carved himself a very particular niche via a body of films that includes such gems as Abigail's Party, High Hopes, Naked, Life is Sweet and All or Nothing, works that examine private lives in turmoil with a mixture of unnerving accuracy, tragedy-tinged character comedy and open parody. Leigh's method of script construction is famously unique: he devises the story and characters (his early films carried the credit "devised by Mike Leigh"), selects his actors, works with them for some weeks, encouraging them to improvise freely, then constructs the script based largely on the results. When it works best – as in the magnificent Life is Sweet – it produces films that are both an exaggeration of reality and completely true to life in a way that marks Leigh as one of this country's finest and most important film-makers. So it came as something as a surprise when it was first announced that was making a film that was not a slice of modern social observation located in suburban London, but a biographical backstage musical set in Victorian times. Could this possibly be a Mike Leigh film? The Mike Leigh? As it turns out, yes. Leigh has in his time directed extensively for the stage as well as for film, and his passion for the theatre comes across here in spades. Topsy-Turvy revolves around the hugely successful (and influential) partnership of William S. Gilbert and Arthur Sullivan as their latest production, 'Princess Ida', opens at London's Savoy Theatre. Reviews, though favourable, highlight a lack of evolution from their previous works, and audiences soon dwindle, not helped by a particularly unpleasant summer heatwave. Gilbert expresses frustration and Sullivan declares that he will write no more comic operas and instead follow his ambition to create the grand opera he believes the public now expects of him. But a chance visit to a Japanese exhibition in London – which includes a kendo demonstration and a theatrical performance of a scene from The Forty-Seven Ronin – inspires Gilbert to create a script that re-unites him with his long-time collaborator, and becomes what was to prove one of their very greatest successes, 'The Mikado'. Biographical films, especially historical ones, are tricky beasts to get right, as there seems to be an almost universally accepted template for their presentation that most film-makers seem to feel obliged to follow. At its worst this is stiff, reverential, visually impressive and dull, but just five minutes into Topsy-Turvy you just know that Leigh has no intention of walking this road. Even the first shot, of theatre workers meticulously checking the seats for the opening night of the new opera, seems to proclaim that this one is going to break the mould. Where the film does share common ground with Leigh's other work is in its concentration on character, its lively dialogue, its extraordinary performances, and the frankly jaw-dropping level of character detail. Selling Leigh's improvisational approach to the uninitiated is a job and a half here, especially given the period setting and subject matter and the fact that film runs for 152 minutes. Adding to that, the single paragraph plot summary above pretty much covers the essentials – the rest is all about character and performance, and we are almost an hour into the film before Gilbert even finds his unexpected inspiration. But therein lies the film's very real delight, in allowing us to be privy to the private lives of these public figures, in the backstage camaraderie and ego-duels, in following the process from the moment of inspiration to the completed opera. Leigh makes it all work so well because he refuses to sugar-coat the lives he is portraying: Sullivan is shown to be struggling with kidney disease and bored with creating the very works that have brought him his fame, whilst Gilbert comes across as self-centred and relentlessly downbeat about just about everything ("There's something inherently disappointing about success," he morosely states after The Mikado's triumphant first night). It's an attitude his wife Kitty finds increasingly wearisome, despite her efforts to maintain a devoted and chirpy front. Elsewhere Leigh subtly links these issues to the social conditions of the time – as Kitty uses theatrical metaphor to communicate to her husband her despair at their childless and sexless marriage, Sullivan's mistress Fanny makes her own arrangements for another abortion in a society that shuns children born out of wedlock. This prejudice has also ensured that lead soprano and single mother Leonora Braham is unable to find a male suitor, a situation that has driven her to drink, an addiction that is starting to threaten her career. All of which may make Topsy-Turvy sound like a dark and even depressing tale, but nothing could be further from the truth. These elements are weaved unobtrusively into a film that is infused with a passion and a love for theatre, and one that must rank as Leigh's most uplifting and dare I say joyous work to date. Leigh combines a sly narrative economy – Gilbert's moment of fourth-wall breaking moment of inspiration is followed by an imagined musical number and a scene in which the completed script is being read out to a delighted Sullivan – with extended scenes in which we just sit back and watch the performers explore their characters. And not for one second is it even remotely dull or drawn out. Leigh has complete faith in his material and his actors, and neither let him down. This blend of trust and talent gives birth to scenes that are an absolute joy to watch, principally for the character detail and what the performers bring to the table: Sullivan energetically running though a musical number with his three male leads; the eight minute rehearsal sequence in which Gilbert attempts to iron out the performance eccentricities of his cast; the hilarious attempts to make the leading ladies walk in 'a Japanese manner' that culminates in a glorious rendition of Three Little Maids From School Are We... this list goes on and on. Without doubt the film's principal pleasure lies in its performances, and rarely have I seen a film with such consistently marvellous acting across the board. Every character leaves their considerable mark, especially in ensemble scenes, where every line is played to a finely judged hilt. Selecting individual cast members for specific praise is an almost redundant task, but special mention must nevertheless go to Allan Corduner, who is just magnificent as the effervescent Sullivan, with his skill as a pianist also put to splendid use. He is given a serious run for his money by Leigh irregular Jim Broadbent as Gilbert, Wendy Nottingham as the no-nonsense Helen Lenoir ("The more I see of men, the more I admire dogs"), Ron Cook as D'Oyly Carte ("Well I don't know about you, but speaking for myself I could murder a pork chop"), Lesley Manville as the resiliently put-upon Kitty, Martin Savage as George Grossmith, Timothy Spall (another Leigh irregular) as Richard Temple, and Kevin McKidd as Durward Lely, a Scotsman who feigns an aristocratic English accent when in the theatre, which he happily drops when eating with friends or intimidating staff. 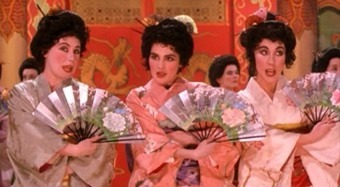 As if that weren't enough, every one of them holds their own in their energetic performances of Gilbert and Sullivan musical numbers that pepper the film, keenly illustrating the sheer breadth of talent required of theatre performers worth their salt. Topsy-Turvy may on the surface seem an atypical Mike Leigh film and in many ways it is, but it's also his most accessible, and demonstrates many of the qualities that have made Leigh one of the key film-makers of his generation. In the end, though, it comes unreservedly recommended not for the man behind it, but for what it is, a multi-layered, beautifully performed, joyously exuberant celebration of the world of musical theatre, and of two of its most celebrated, talented and fascinating figures. A clean, bright transfer that nevertheless loses gobs of points through being non-anamorphic. This was particularly irritating on its release because it marked a dual standard on the part of distributor Pathe, who have released anamorphic prints of big Hollywood films such as The Fifth Element but consistently failed to deliver the goods on smaller works such as this (though let's not forget that Topsy-Turvy won two Oscars and was nominated for two more). It's a particular sore point because the American region 1 disk sports the anamorphic print this should have had. The 5.1 sound mix is bright and full, but weighted to the front sound stage, which is fully utilised. A bit more rear speaker action would have provided a more involving mix, but otherwise no complaints. The music otherwise sounds terrific and the dialogue is always crystal clear. Apart from the expected theatrical trailer (though this is really well cut together, if technically inferior to the main feature in terms of picture and sound), there is only one, and it's this alone that gives Pathe's disk an edge over its anamorphic region 1 counterpart: a director's commentary track. Not only was this the first Mike Leigh commentary to appear on DVD, it's quite simply one of the most compelling and informative I have yet heard. Leigh provides an absolute wealth of background detail about not just the film, but the lives of the main characters, the music chosen by arranger Carl Davis, and the facts behind scenes that it would be easy to assume were fictionalised. There are almost no dead patches, Leigh only going quiet at the end when, as he says, the scenes work so well there is simply nothing for him to add. 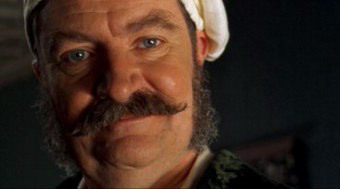 Topsy-Turvy is a marvelous film, a gorgeously performed and detailed character piece that reflects Leigh's own love of theatre and has more character detail in one scene than most period films do in their entire length. Despite pushing plot to the background, it creates such a sense of pace through the performances, the music, the rich layering and energy with which it is assembled, that the 152 minute running time literally flies by. The result is one of the best biographical films I have ever seen, and a text book example of how it is still possible to make a vibrant and original work from seemingly familiar material. Whether you choose to buy this disk or the region 1 equivalent will depend on your fondness for director's commentaries. If you do not care for them then go for the region 1 – it has an anamorphic transfer, a featurette and a photo gallery to recommend it. But if you really want to know more about the background to this film, about how it was made, researched and cast, then Leigh's commentary is a must, and the region 2 disk wins on that alone.